SATA3 hard disk performs much slower on SATA2 motherboard, and I have just confirmed that in my little experiment. I took WD5000AAKX SATA3 hard disk and tested it on Asus M4N78 SE motherboard with SATA2 controller. Then I have measured time needed to copy a 700 MB simple DivX movie file. Antivirus and other programs were closed, test was repeated 5 times with different files to be sure that system was not caching it, and result was miserable 32.2 MB/s! Actually, measured speed is for copying and writing to the same disk, no matter on which partition or part of a disk. Just reading files from hard disk to memory (RAM) is much faster, for example when you load a big file into Photoshop. Here is a picture taken with HD Tune Pro that shows disk reading only. 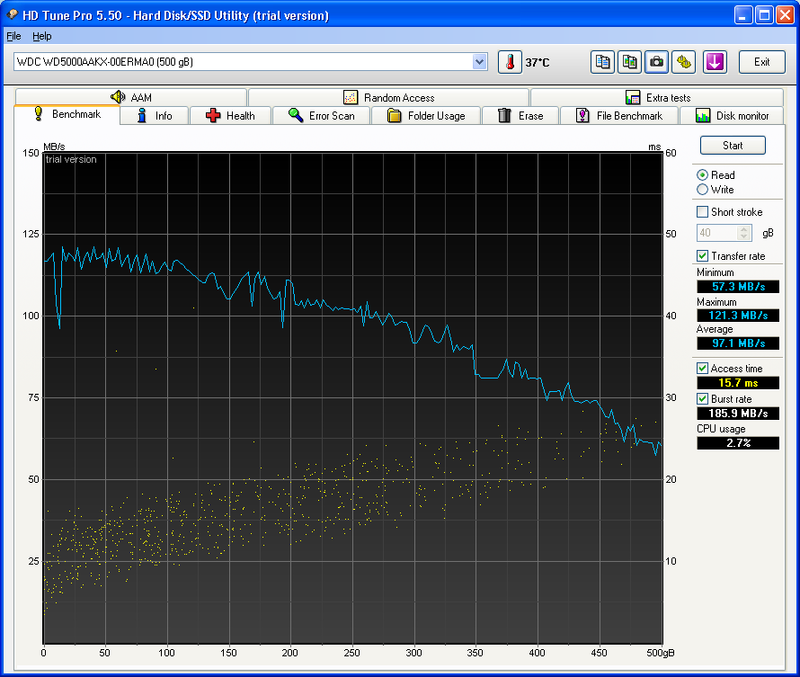 After that, I put a little jumper to pins 5 and 6 of hard disk WD5000AAKX, and measured again in the same enviroment. Results are much better – copying the same single large file was at 41.2 MB/s, about 30% faster! Here is a graph. This is the best you can get with this configuration, so I recommend buying a SATA3 PCI controller to achieve greater speed up. Better option is to change motherboard, but you’d have to change the processor (CPU) and memory (RAM), because newer boards support different types of CPU (for example AMD FM2) and a faster DDR3 type RAM. If upgrading is not an option, just put jumper on hard disk and you will get 30% faster hard disk in no time, for free. You need to put jumper vertically to second column when looking from the power and data connectors. On WD disks these are pins 5 and 6. Simple as that, enjoy speed and share the story!